Black Ops 4 brings a host of new Perks for players to use. They’re assigned at the Loadout menu, with multiple tiers available. There’s a lot of them, each applying a different effect to the player. And while all of the Perks are useful in certain situations, there are some that are far better than others. 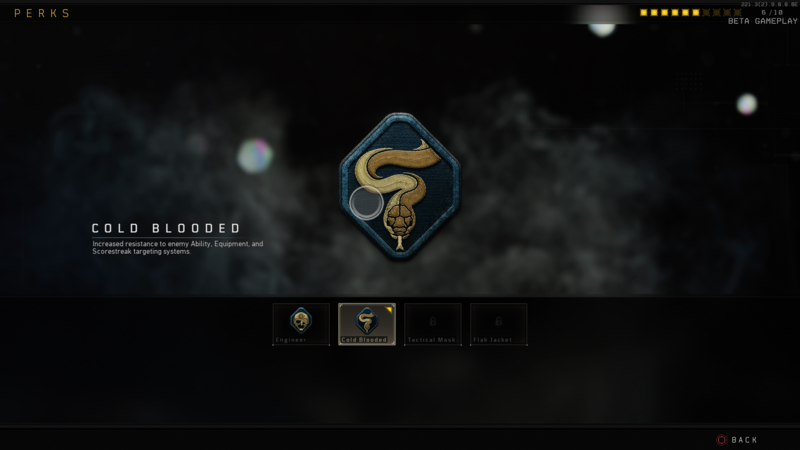 In this Black Ops 4 Perks Guide, we’ll list all of the Perks you can unlock in CoD Black Ops 4. We’ll take a look at what each one does, and also give you our thoughts on what the best Black Ops 4 Perks are. For more on Black Ops 4, be sure to head over to our Call of Duty Black Ops 4 Guides Hub. It’s a one-stop shop for all of our info pages on Black Ops 4. You’ll find essential tips to help you rack up more kills, a look at Operator Mods and more. Perks are a great way to up your game in Black Ops 4 Multiplayer matches. They grant you a variety of abilities, from being able to hold your breath for longer to tagging enemies through walls. We’ve got details on all of the Black Ops 4 Perks below. There are 13 Perks to choose from in Call of Duty Black Ops 4, each with their own effects and stat boosts. You can have three selected at a time, though only a small selection are available in each slot. We’ve listed all of the Black Ops 4 Perks below, alongside a description of each. Tracker - The Tracker Perk allows you to get the jump on enemy players, and alerts you if anyone is flanking you. It’s incredibly useful. Ghost - Being undetectable while planting bombs is a real plus in some game modes, and UAVs can’t see you if you’re moving. Scavenger - It’s super easy to run out of ammo in Black Ops 4, especially if no-one on your team is throwing out ammo packs at the right times. Being able to scavenge ammo is really useful then, and means you can carry on using your weapon of choice for longer.